Stu Timms cannot pinpoint why he was recently awarded a substantial two-year Victorian government scholarship. But after hearing his story, we can. The third-year Bachelor of Human Services and Master of Social Work student was last month named recipient of a Department of Justice and Regulation Disability Scholarship. It’s awarded to a Victorian student studying a justice-related course, and chosen on merit. Stu has his sights set on working in youth mental health within the justice system. He says rewind a couple of years and it’s a future he would never have imagined. After secondary college Stu left Bendigo to be part of the BMX scene in Perth. He’d grown up as a sporty kid, with riding and skating a priority. At a Perth beach in December 2009 Stu dove into the surf and hit a sandbank, breaking his neck. The accident left him quadriplegic and put in him hospital for the next two years. At 22 Stu began a Certificate Four in Community Services. “I went to TAFE first because I wasn’t sure what I wanted to do or was physically able to do,” he says. He completed the certificate, then a diploma, which fast-tracked him straight into second year of the La Trobe social work course. His efforts brought big rewards. Stu is now a top student in his course and is employed at La Trobe as a peer learning advisor. 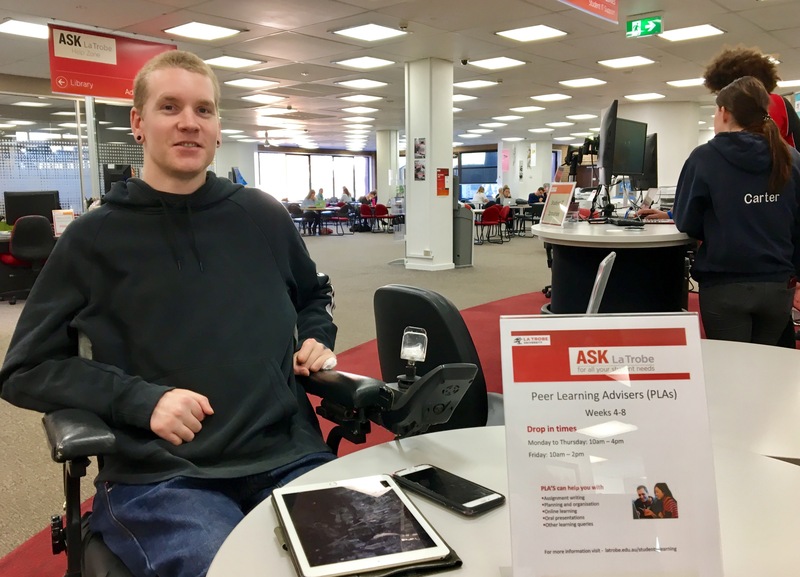 He is part of a team of students posted in the Bendigo library, helping others on campus. His job prospects after uni are also looking good. This week Stu started his first placement, a 70-day part-time role working in the Centrelink social work team.